Getting the right Bunk bed for your child is important. Maybe you have a couple of kids or just want a spare bed for when there is sleepovers. When this happens you need to try and find the best bunk for your kids needs and wants. There are however some factors you should consider before choosing the right type of bed, like the size of the space the room, because the last thing you want is to have to return one that has just arrived. A friend of mine didn’t do the measuring one time and made a major miscalculation and wasted loads of time with the exchange process, so take this example and get it right first time around. Are Bunk Beds Worth It? Yes. They definitely are and if you’re finding the need for extra space, for all the mounting toys, then they will suddenly open up an area of space that before was occupied. Space – Some children’s rooms are smaller than you’d like and for this reason finding a good twin bunk will make for efficient use of space. Some bunks can separate and be used separately, which might suit you further down the line. Having the right amount of space between the bunks is important and sometimes a parent reading bedside stories will be far more inclined to remain focused than when they are crouched down and feel extremely uncomfortable. Height – Some rooms are converted attics or basements with lowered ceilings and therefore have less height than most rooms under normal circumstances, so a high bed might be too high and cause issues when your child is sitting up. Stability and sturdiness – A good bunk will be very sturdy and the solid wooden ones tend to be the best, but some metal frames can also be good too. Make sure to read all instructions when you do get your order and don’t forget to tighten the nuts and bolts as much a possible, which will help reduce squeaky sounds and increase stability. Design – Loads of cool and interesting available designs and you can have everything from varying ladder styles, colors, frames, wood-or-metal and even varying sizes of bunks to allow for the gap in ages because the older one usually wants more leg room. Rails – These are important and if your child happens to be a wriggler then make sure to get one with rails that secure him during the night. Rails vary in height and with some bunks you can adjust to suit your preference. Stair or Ladder – These vary and you can have your pick, but the more staggered the incline the less of a hassle it is for the child having to ascend and descend every morning and night. Assemblage – This is usually the tricky part and makes sure you have some time to assemble, but all parts come with the necessary tools to build the beds, so just get the man around the house to do it. I have put together a small review of some quality twin all at varying prices, sizes and style to make sure you find the right one for your family. This comfy piece of furniture is ideal for those parents wanting to get a good quality bed, but not wanting to go too far over budget and with this, they won’t. The design is sturdy, easy to construct and offers a lot of storage underneath. The safety ladder is secure and easy to climb, especially for those young ones, but can also handle a heavier build too. Most children will be able to fit with large size dimensions and the range of colors available will suit either gender. The packaging on arrival is small and easy to handle, which makes receiving deliveries easy, unlike some companies I’ve had experiences with. This is a good choice and offers a good basis in which to begin this review, further along, I will look into more expensive options and give you justification and reasoning behind them. This metal framed bed is very solid and constructed to last the test of time, even with those kids bouncing around trying to get attention for a bedtime story. The metal frames encompass the top to offer a rail of security and ensure the wriggling child stays safe. This arrives with neat packaging and the construction will be easy to assemble for those worried about setting the bed up, it’s super-easy to assemble even for the likes of me. The ladder is similar to the previous bunk and leads to the top bunk which where the children prefer being I’ve found so you might have to make some ground rules if they are twins. This twin bunk is a slight change than previously reviewed beds due to the larger bottom bunk, which offers an advantage for when you might have different aged children sharing a room. This comes in at the high-end range with a lovely espresso finish and is very well done with a great sheen look. The beds themselves are very well made and offer superior quality and design. There is plenty of room for storage underneath and can offer a good use of space if needed. The safety element has been considered to the fullest degree with staggered 4 step-laddering and allows for an easier angle of incline. The top bunk is smaller than the bottom but offers a bird’s eye view for those children in the know. This is added in at the last-minute for those parents wanting to get a cheaper bed for a low price and can accommodate different aged children who might be sharing. 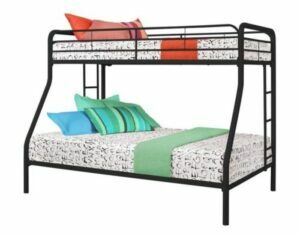 The bunk is easy to assemble with a metal frame and comes in various colors for the design. The bottom bunk is larger than the top and will offer a large space for storage of those vast amounts of toys that seem to be bursting out the seams. The rails are very secure and with ladders equally sturdy and anyone climbing will be felt safe. The design is simple but great for those wanting to save on frame and splash out on the mattress. This bunk is the most expensive in the review and not without some justification I might add, with its solid wood construction it does stand out. 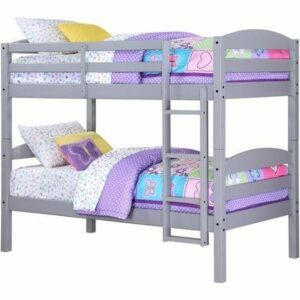 This meets all CPSC specification and with the solid frame, it will give a reassured nights rest for the kids. The bunk has loads of storage capacity and is neatly hidden behind the rich-honey wood which has a lacquer finish, that’s pleasing to the eye. There are 7 storage cupboards in total and the stairs leading up to the top bunk houses them discretely. The bunks themselves offer up to 8-inch mattresses which come as standard and weighs 250 pounds in total, so the solid bunk will be a good buy with an all in one fit. This “Mainstays Hot Twin” is by far my favorite and for good reason, it’s beautifully designed and comes fully equipped. 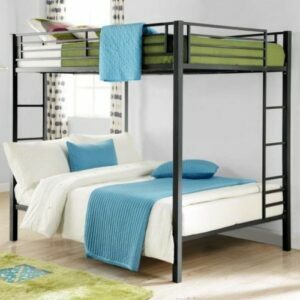 The finish here is superb and will be noticed if you have had an inferior metal frame before, so if you have a little extra to spend this is definitely a great bunk bed to buy. This bed meets all CPSC standards and is very sturdy. The storage capacity leaves the room feeling clean and neat, unlike others that leave an undercurrent of mess that seems to constantly want to spill out at any moment. This is a fantastic bunk and will keep those children snug as a bug in a rug. 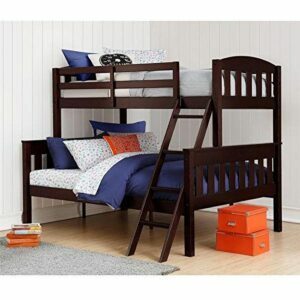 The Dorel bunk is a simple twin bunk with all the basic features one would expect from a kid’s bunk bed. The frame is secure and keeps the kids safe with surrounding rails. There is loads of space both top and bottom and will ensure a sound sleep without any discomfort, although this isn’t luxury it is good value for money.